Multi VRF Units from 16kW to 50kW. A split type (or paired) system can be installed in many different applications ranging from an office, apartment, shop, pharmacy and Comms Room. The heat pump system provides energy efficient heating & cooling to the area being served. There are many different configurations that can be used and the different types of indoor units can be seen below. Follow the Link to our catalogue on paired units systems. A Multi system allows up to 9 indoor units to operate from a single outdoor unit, thereby reducing installation space and costs. All indoor units can be individually controlled and do not need to be installed at the same time – extra units (up to a maximum of 9) can be added later. Different types of indoor units — wall mounted, concealed ceiling, floor standing etc – in different capacities can be mixed together in Multi system applications. A single outdoor unit can heat up or cool down a complete house, office or small shop at different times. 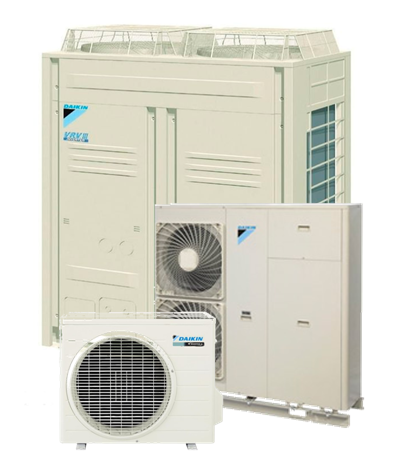 With Inverter technology and cutting-edge control technology for refrigerant, the VRV®III air conditioning system operates with outstanding efficiency. This contributes to high energy savings, which greatly reduces your running costs and facilitates better building management. Our VRV® systems include indoor and outdoor units available in a wide range of models for various building sizes and installation conditions. Long refrigerant piping lengths and other features put few restrictions on design for great flexibility in meeting needs of the building. Airflow services installed systems which provide heating and cooling to 158 different indoor units throughout the EMC facility. A large ventilation system was essential to the project and Airflow was was involved in the construction and balancing of this also. Wider Air discharge thanks to coanda effect. Ideal solution for shops, restaurants or offices without false ceilings.